When it comes to cabbage, nutrition experts agree that it is one of the more beneficial plants people can regularly consume. Those who wish to obtain optimal health are wise to include this leafy vegetable as a dietary staple, but should also know that its over consumption can also lead to side effects. Understanding the nutritional facts associated with it, however, helps people design a diet that gives them all of the benefits of this cruciferous vegetable without the risks. Other varieties include Napa or Chinese cabbage, and bok choy, which contains the highest amounts of vitamin A. In studying cabbage nutritional facts researchers have found important phytochemicals known as indoles, which burn estrogen. Indoles also prevent the harmful cellular mutations that cause colon cancer. A few of the phytochemicals discovered in this vegetable also produce enzymes that fight cancer. As a source of dietary fiber, all types of cabbage are good, but red varieties tend to have a higher fibrous content than green ones. Red varieties are also higher in iron, calcium and potassium. Cruciferous vegetables are also known to reduce the risk of developing cardiovascular disease. This food is not commonly associated with allergies and does not contain an inordinate amount of purines or oxalates, which makes it a safe food for most people to eat. However, in excessive amounts, cabbage can contribute to the development of goiter or thyroid dysfunctions. The benefits of cabbage nutrition, along with the many ways in which it can be prepared, have caused this leafy vegetable to be a worldwide dietary staple. As an inexpensive, very healthy food choice, it is easy to incorporate into all diets that are designed to support good overall health. For the most potent benefits, cabbage that is organically grown is best. 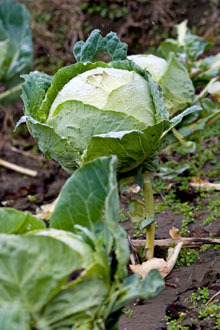 When preparing cabbage, lightly steaming it is considered to be the most effective way of retaining its phytonutrients.